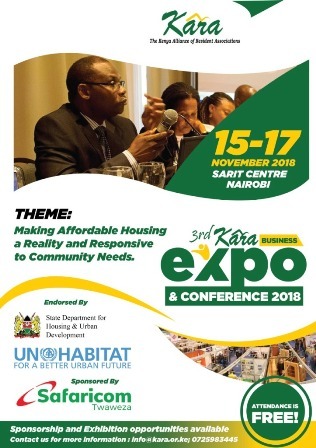 The Kenya Alliance of Resident Associations has organized a 3 day Business Expo & Conference to be held on November 25th to 27th 2016 at the Sarit Center in Westlands, Nairobi. NATION: After graduating from the university last year and getting a job on the outskirts of Nairobi, Judy Wangui, 24, decided it was time to be independent since she had spent her years as a university student moving from one relative’s house to another. NATION:“There’s a perception that with real estate, one can never go wrong,” he says. “Many people with spare money to invest fancy property because of its (perceived) hands-off approach when it comes to management. The Nairobi City County Government (NCCG) has embarked on implementation of the Nairobi Integrated Urban Development Master Plan (NIUPLAN) whose preparation was finalized in 2014. The goals of the plan include: To provide spatial order of physical investments; Enhance quality of life for inhabitants; Guide investments by providing location criteria; Embrace the evolving urban policy regime in integrating social economic, environmental and political issues under one unitary framework. The County Government has identified priority programs in various sectors to be undertaken under the NIUPLAN. The sectors include urban development; urban transport; infrastructure development; Environment and urban development management. Kara has been invited by the County Government to be part of the team that will monitor implementation of the plan and provide feedback. We intend to play an active role not only in monitoring implementation of the plan but also in the design of the various projects under the plan. Preparations to host the KARA Business Expo & Conference on November 25 – 27, 2016 at the Sarit Center, Nairobi, are at an advanced stage. Join us in welcoming on board our latest sponsors: Wadi Degla Clubs; KK Security and Nairobi City Water & Sewerage Company. Thank you for identifying with this great event! Sustainable Development Goals: Government challenged to invest in public awareness and education. The Nairobi City County Government (NCCG) has embarked on implementation of the Nairobi Integrated Urban Development Master Plan (NIUPLAN) whose preparation was finalized in 2014. The Star: Laws guiding the establishment of towns and cities will be amended to reflect the current realities, Lands CS Jacob Kaimenyi has said. The Standard: Residents living in houses that sit on land earmarked for the Sh300 billion Urban Renewal Project will be given money for alternative housing. Most people would agree that Nairobi is one of the most pedestrian-unfriendly cities in the world. The 51st edition of the Kara Bi-monthly Talk Series (BTS) forum was held on 11th October 2016 on the theme: Understanding Sustainable Development Goals and expected impact on Kenya’s development. 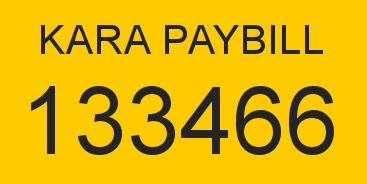 Kara Expo: Have you registered for Kara Business Expo & Conference? Preparations to host the KARA Business Expo & Conference on November 25 – 27, 2016 at the Sarit Center, Nairobi, are at an advanced stage. Kara has been nominated to be part of a taskforce to be appointed by the Governor to engage Nairobi City County Government in finding solutions to the challenges facing businesses and residents of Nairobi. The Kenya Alliance of Resident Associations (KARA) is honoured to be among the Presidential Awardees during the Kenya Revenue Authority (KRA) Taxpayers’ Day 2016. Plans are underway to develop a Bus Rapid Transit (BRT) system in Nairobi in order to improve the quality of public transport provision and enhance social mobility of those that live and work in the City. The National Land Commission (NLC) will work with Kara to address various challenges affecting management of public land, especially open spaces within neighbourhood. As you may be aware, the Bus Rapid Transit (BRT) is a locally appropriate means of improving the quality of public transport provision in many cities around the world. Nation: After living in Zimmerman for most of his life, Mr Dennis Gatune, an IT manager with a city-based firm, decided to move out after seeing the estate decline drastically. KARA participated in Nairobi Governor’s round table meeting with Business Membership Organizations (BMO) where various service delivery issues were discussed. The Cabinet Secretary for Environment and Natural Resources Prof. Judi Wakhungu has called on mobile phone operators and relevant Government agencies to partner with Residents Associations in creating awareness regarding the effect of Electro Magnetic Frequency (EMF) emanating from Base Transceiver Stations (BTS). What is the health & environmental effect Electro-Magnetic Frequency (EMF) from Base Transceiver Stations?